Where does perception end and reality begin? Can your mind actually cause something to happen in the “real” world? What happens when we throw out our conception of the limits of space and time? When science, government, and big business clash, who will ultimately have control of our information, our privacy, and even our very thoughts? 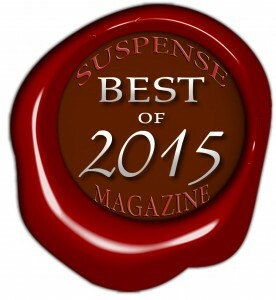 Trial Run reached #2 on the October 2015 CBA fiction bestseller list in the fantasy/sci-fi category. Awarded a “Best Book of 2015” by Suspense Magazine in the Thriller/Suspense category. Reese Clawson’s work is mind-bending—literally. Her company specializes in global data analysis for an elite group of industry executives, and now a lucrative government contract is moving her into the realm of cutting-edge intelligence gathering. She is determined to crack the limits of consciousness–and in doing so, the boundaries of secrets and lies. But her experiment crashes as test subjects slide into a coma-like state. 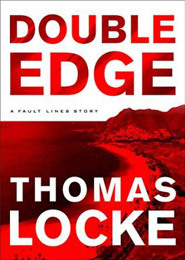 Reese is left scrambling to maintain control, drawing three disparate people into the search for answers: an adrenaline-amped thrill junkie with altered brain chemistry, an Italian scientist working on remote-viewing technology, and a math prodigy whose algorithms subvert computer encryption. Will this piecemeal team prevail when a government operative is sent to investigate? As the threads of perception and reality become tangled and even time itself twists in unexpected directions, one warning remains clear: what you don’t know can kill you. 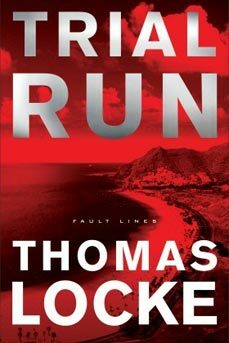 Trial Run, book 1 in the Fault Lines techno-thriller series, released August 4, 2015, from Revell. This pulse-pounding story combines the science of today with possible scientific breakthroughs of the future. Discover how it all began in this explosive prequel to Trial Run . . . There isn’t much that can throw Charlie Hazard off balance. But the mystery woman with the striking eyes and the intense request to follow her—now—just might accomplish it. Knowing little more than her beautiful name, Charlie leaves his post as a guard at the Satellite Beach community center for what he thinks is just another risk-containment job. But Gabriella, an experimental psychologist, has far more in store for him than protection duty—if the two of them survive the test. 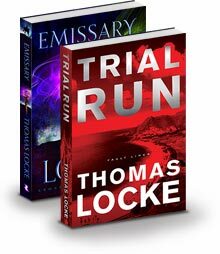 Leave behind your perceptions of what is possible and race into the unknown corridors of human consciousness in this breakneck prequel to Thomas Locke’s Trial Run.